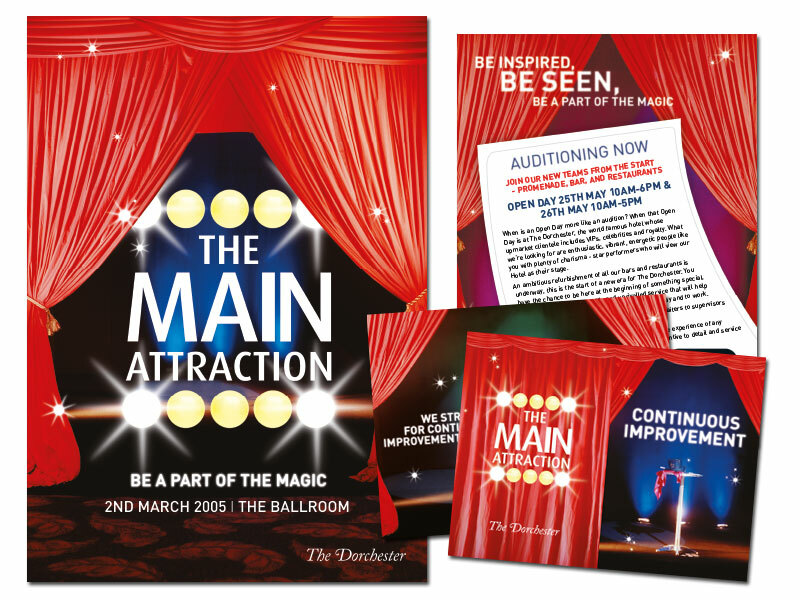 WDAD were commissioned by The Dorchester to produce a suite of internal communications material that complemented the Vision and Principles introduced to all employees at the hotel. With over 140 languages spoken by staff at The Dorchester, the work created had to be simple, easy to understand and instantly recognisable. WDAD were given access to a research project and, in addition to conducting internal meetings with key stakeholders in the process, we built an in-depth understanding of the business objectives of the hotel and of the part that employees would need to play in achieving those objectives. The concept WDAD developed was based around the premise that the hotel was ‘London’s most sought after hotel to work in, stay in, be seen in and own’. In order to gain a high degree of buy-in from the whole team, WDAD proposed that the new brand be launched internally at a ‘party’ in the ballroom at The Dorchester. Personal invitations were designed and sent out to all employees, along with promotion posters for the event that were placed strategically around communal areas. The style of the event mirrored the brand (including magicians, stage sets, etc.) and each member of staff was given a pack of information cards highlighting each of the hotel’s Values, along with a playing card style box to keep them in. The event was attended by over 500 employees; a great start, but to keep the momentum going a further poster campaign was produced, along with presentation templates for all training sessions, inserts to be sent out with pay slips and postcards that we’re produced for every employee at regular intervals.